In the not too distant past, eight-speed automatic transmissions were almost exclusively fitted to big luxury sedans with a six-digit price tag prominently displayed on the window sticker. In Europe BMW democratized the eight-speed in smaller cars by offering one in the 1-Series and now, Volkswagen is applying the concept to pickup trucks. For the 2012 model year, the Volkswagen Amarok will get an eight-speed automatic borrowed from the Touareg SUV. 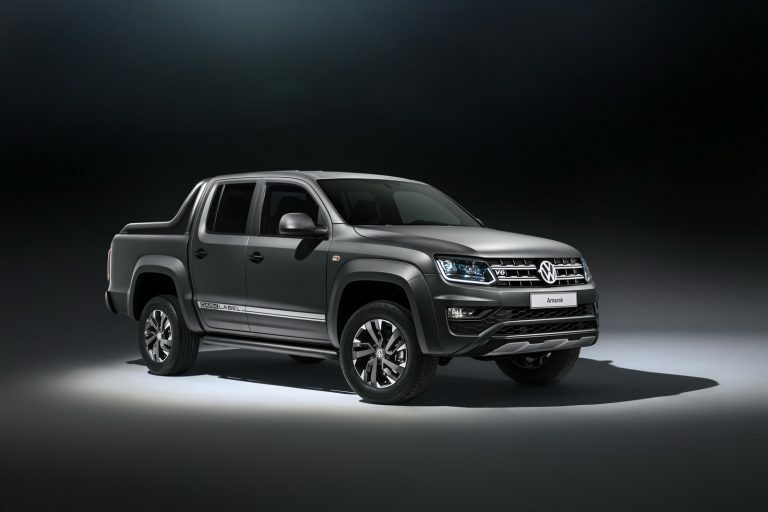 This is the first time since the Amarok’s launch in late 2009 that it is offered with an automatic transmission, a feature that buyers have often demanded. The other noteworthy change that will take place under the Amarok’s hood is that the eight-speed will be mated to a 180 horsepower, 310 lb-ft version of the existing 2.0 twin-turbo TDI taken from the California van’s parts bin. The 163 horsepower version of it will also be available with the eight-speed, while the entry-level TDI that packs a scant 122 ponies will be dropped altogether. “Thanks to this greater spread the TDI engine works even more effectively in every rev range, and it is more fuel-efficient and agile. Moreover, 8th gear was configured as a fuel-saving overdrive gear that operates at reduced engine speed. The first gear is configured for pulling away in off-road use or when towing”, Volkswagen explained. In an effort to further reduce emissions and raise fuel economy, the 180 horsepower engine will use Volkswagen’s Bluemotion technology which includes a Start and Stop system and low-rolling resistance tires. According to the German automaker the revised Amarok now boasts 31 miles per gallon in a mixed European cycle, making it more efficient than a comparable model equipped with a manual transmission. Another benefit of the new drivetrain is increased towing capacity, which gets bumped up to 7000 pounds, almost a thousand pounds more than before. Why is this truck not for sale in NA?!?!?!!? ^ Why? Because America. Enough said. Why is this engine/transmission not available in the US? For those wondering why the Amarok is not forsale. First, I guess it would have a 25% import tarrif. Unless VW builds this in North America. Second, it would most likely be VERY expensive. Look at the Tiguan prices. Ford and Volkswagen announced they were exploring a strategic alliance earlier this year, and it appears the talks are heating up as Ford CEO Jim Hackett is looking to drive down costs. According toReuters, which cites Ford execs, the Blue Oval wants to increase profitability by jointly developing vehicles with competitors and producing models in the same factories as rivals. The talks with Volkswagen initially focused on the possibility of developing a “range of commercial vehicles together” and initial reports suggested the companies were primarily focused on a van partnership. Volkswagen’s Latin America chief executive Pablo Di Si confirmed the discussions are “advancing positively” and might result in a partnership in Brazil. Reuters also suggests Ford and Volkswagen might pool their resources and combine production in both South America and Europe. Two sources told the publication that Volkswagen could get access to the Ranger pickup and Transit van. If the deal goes through, they could serve as replacements for the Volkswagen Amarok and Transporter respectively. Ford is also said to be eyeing an expanded partnership with Mahindra. The initial agreement focused on a jointly-developed midsize SUV, which will be built on a Mahindra platform, but now there’s talk of a jointly-developed platform. The first model to ride on the architecture could arrive by 2020. When the partnership was originally announced earlier this year, Ford and Mahindra said they would also look into the possibility of jointly developing an electric vehicle and a compact SUV. The two are also considering sharing powertrain options, and this could result in Mahindra engines being installed in Ford vehicles. It remains to see what comes to fruition, but a number of Ford jobs are likely on the line as the automaker is reportedly eyeing plant closures and staff reductions. Even if the talks don’t pan out, the report says Ford Europe is planning to phase out the C-Max, S-Max, Mondeo and Galaxy, which could result in lay offs. HANNOVER -- Volkswagen Group has signed a deal to develop a pickup truck with Ford and may extend its alliance to include autonomous driving and mobility services, the German automaker said. In January, VW and Ford agreed to develop a range of midsize pickups and commercial vehicles. They also agreed to explore cooperating on electric and autonomous cars as part of a sweeping alliance designed to save each automaker billions in costs. The successor to the VW Amarok pickup will be the first joint vehicle project with Ford, Volkswagen Commercial Vehicles CEO Thomas Sedran said on Thursday. Ford has a platform for its Ranger midsized pickup truck, which could help VW lower development costs. Other joint vehicle projects may follow including joint EVs, Sedran said, without elaborating.